She was in Chiligo Village in Ntcheu for holiday from Lilongwe where she was schooling. Her plan was to spend two months in the village before returning to the capital city to continue with her studies. 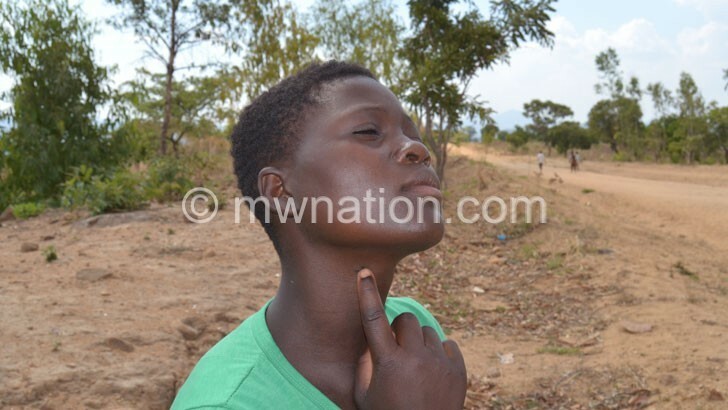 Her holiday became a sad turning point in her life as, two weeks after her arrival on June 28 this year, Alice Kayesera, 17, was shot by Malawi Prison Service warders hired by the Ntcheu District Forestry Office to confiscate charcoal in her village. The Standard Six girl met her fate as she innocently walked across the village to visit a friend. She was shot in the neck. Recollects Kayesera: “I only remember that there was a vehicle coming from the opposite direction on my way back home. After the car drove past me, I felt dizziness after an object patched my neck. Today, six months later, the girl is still living with the bullet after medics failed to operate on her. Ntcheu District Hospital established that Alice was shot and referred her to Kamuzu Central Hospital (KCH) in Lilongwe where she was admitted. A provisional diagnosis on a medical report we have seen indicates that the bullet was in the cervical tissue found near the base of the neck. The report says removing the foreign object would put the girl’s life at risk. She was given painkillers and discharged after a month. The fact that she will live with the bullet the rest of her life traumatises her. During the interview at her family house about 30 kilometres from Manjawira Trading Centre, she was confused as to why she should continue living with a bullet in her body. Alice, who dreams of becoming a nurse, has since dropped out of school. “I cannot go back to class with a bullet,” she said, breaking down in tears. Her life is no longer the same as she also experiences memory loss and has difficulties to swallow food. Her brother, Christopher Kayesera, said a month after the incident, Ntcheu Prison authorities summoned the family to a meeting where they were offered K270 000 as compensation. Ntcheu Prison spokesperson Andrew Mang’anda refused to comment on the issue of compensation to the family. He also refused to comment on why prison warders were engaged for such an assignment. Ntcheu Police Station spokesperson Hastings Chigalu said police arrested four prison warders following the shooting incident. The suspects are Richard Luwani from Mbera Village in Balaka, Beston Lawe from Kapitapita Village in Zomba, Lyson Adriano from Kasankha Village in Mangochi and Samuel Mailosi from Simoni Village in Zomba. But our findings at Ntcheu First Grade Magistrate’s Court showed that the State asked for the withdrawal of the case on the basis that it would meet medical expenses for Alice’s surgery. But Alice’s brother said there is no communication with the State on the move. Ntcheu district forest officer Donex Mtambo does not see any problem with hiring prison warders instead of well-trained police officers. In June this year, prison warders at Ntcheu Prison also shot a grandmother following a fracas at the forest. Reacting to the development, Malawi Human Rights Commission (MHRC) director of civil and political rights Peter Chisi said the taxpayer-funded human rights watchdog would investigate the matter. He said: “It is all about whether there is justice for the victim. In terms of the embedded bullet, that should also be looked at from the perspectives of what long-term impact it will have on the life of the child as she grows up. Alice’s family depends on piecework for survival.